The advanced design of our reel mower makes it 40% easier to push and offers a friendly, easy way to mow your lawn. The combination of Fiskars technology makes the StaySharp Plus Reel Mower 40% easier to push than other reel mowers, helping you get more done with less effort. The StaySharp Plus Reel Mower combines patent-pending technology with superior ergonomics to deliver best-in-class cutting performance without gasoline, oil, charging, the hassle of cords or the noise created by other mowers. 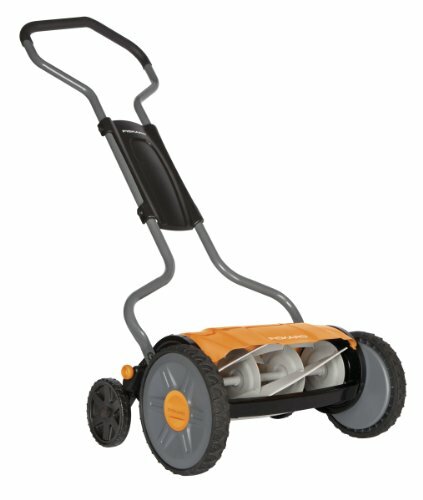 It features an InertiaDrive Reel for 75% more cutting power than standard reel mowers; StaySharp Cutting System to eliminate the cost and inconvenience of annual blade sharpening; and a unique grass discharge chute that throws clippings forward cleanly, away from your feet. Though other reel mowers struggle with certain types of grass, the superior cutting system of this reel mower cuts all common residential grasses, even tough southern varieties such as St. Augustine, Zoysia, Bahia and Bermuda.